Thank you for your interest in supporting the ACP. You can become a donor to ACP causes or an ACP sponsor here. 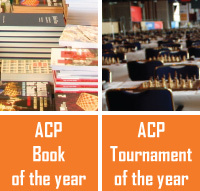 If your gift is 1000 Euros or more you will be designated an official sponsor of ACP and will appear as such in ACP Newsletter as well as on ACP website. Giving under 1000 Euros will earn an ACP Donor designation and a recognition as such. ACP is a non-for-profit organization and Board Members do not receive salaries for their work, therefore you can expect your contribution to fund solely the activities that ACP supports. Additionally your contribution may be tax-deductible depending on your country of residence. We will revert back with a receipt of your generous contribution from our non-for-profit organization to help you with your tax deduction.